This morning I woke up around 5:15 to get in a 3-4 mile run. Originally, Jason and I had planned on doing speed work after work. However, with our temperatures back into the 100's and air quality on the decline, I thought it was smarter (safter) to scratch that run and go with a Plan B. My plan B was a solo run around the neighborhood. I won't lie, it does make me a little nervous to head out in my neighborhood when it's still dark out. I haven't figured out exactly how to carry both my water bottle and mace. Any tips? 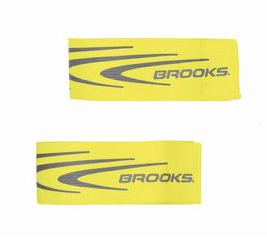 I do wear a reflective arm band made by Brooks Running as well as a flashing light that I attach to my shorts. And I do carry my ID. If you do run at night or dark morning hours, I highly recommend Brooks' Nightlife line of clothing and accessories. As much as I wanted to go a different route, since I was solo and it was dark, I stuck to my normal route. I figured if anything happened, Jason would know the direction I ran and the path I took. Luckily, no iffy people were out, no random stray dog, just a quiet, peaceful (hot) run. I ended up hitting 3.6 miles and almost went for an even 4 - that's the OCD side of me of course. But I did good and reeled myself in, rather begrudgingly I'll admit. My pace was quicker than I expected - overall average of 9:04. I managed negative splits with each lap (9:27, 9:01, 8:50, missed the last lap split), which always makes me feel accomplished. Do you get nervous running alone? I try to be very aware of my surroundings. I don't listen to music, and I stick to a familiar route. I've actually had one very frightening incident where I was actually followed by a car of men, but decided I can't let that dictate my life and keep me inside. Luckily I've never experienced something that caused me to question making it back to my house or car - like heat exhaustion, dehydration, etc. But those are certainly other safety factors to consider. Have you ever experienced a frightening incident during a run? How did you handle it? I know that there have been recent tragedies where female runners have been killed while out on a run. Runners and cyclists have perished because of drivers not paying attention as well. Or what about an injury, or suddenly getting ill, over-heating, etc. So how do we protect ourselves? Do we live in fear or just live aware? Right after my incident, I was almost numb, maybe in shock and denial that something really bad could have happened. I started running with mace and followed a tip to vary my times and routes, but sticking to familiar routes, and those that are better lit as well. Here's a great list of safety tips like varying the times, not listening to music, wearing a whistle, and knowing some businesses that might be open (love this idea actually).